Golf Tailor LLC did an outstanding job as far as marketing for XE1 Wedge. We wrote this XE1 Wedge golf club review to know more about it. But while they were at it, they made pretty bold claims about the club, and some of the hype seemed too good to be true. They promised golfers that the sand or pitching wedge would get them out of bunkers with a single shot and claims that the XE1 is one of the best golf wedges out in the market today. With a lot of golf clubs on the market, how do you choose the right one? Before we review the XE1 wedge, let’s discuss the major flaws of traditional golf wedges. It’s no secret that most players are struggling with their short game and it's frustrating. You spend hours practicing your swing and how to improve your chip shots and fat shots. You do everything that was advised to you when doing bunker shots - you bend your knees, You bend your knees, and you keep your head down. But with all the hours you’ve spent mastering the bunker shot, nothing seems to make a difference. But here’s a secret no golf club or sand wedge manufacturer will tell you. You’re not the problem, but the design flaws of traditional wedges that are making you miss the distance and bounce needed to take you out of the sandbank. You bend your knees, and you keep your head down. But with all the practice hours you spend in mastering the bunker shot, nothing seems to make a difference. But here’s a secret no golf club or sand wedge manufacturer will tell you. You’re not the problem, but’s design flaws of traditional wedges that are making you miss the distance and bounce needed to take you out of the sandbank. Design Flaw #1: The Leading Edge Causes Short Shot and Turf Digging. The traditional sand or pitching wedge design advantage is with the bounce that is supposed to bounce your club head off of the sand and help the ball into the air. When you swing with a standard wedge an inch or two behind the golf ball, the wedge will dig into the sand or turf. This will absorb the energy of your swing before hitting the ball which will result in fat shots. If you try to avoid a fat shot, the front edge of the wedge connects to the ball which results in a thin shot that will send the ball flying over the green. The narrow sole results to thin shots which add strokes to your game. Traditional wedge is made with a narrow sole (the bottom of the club), and this forces the player to open the club face. With the face open, the golfer has reduced the club face hitting area and brought the sole and hosel into play. This causes the club to bounce off the turf and sand, which leaves little room for error and often resulting in an uncontrollable thin shot and the occasional shank on all wedge shots. To prove the effectiveness of the XE1 Wedge, former PGA Tour pro Arron Oberholser asked long-time golfer and 18-handicapper, Allan Brilz to take a few wedge shots with the new XE1 wedge. Allan didn’t take a single practice swing and was not coached on his wedge technique. Allan picked up the xE1 wedge and hit three straight shots over the bunker and on to the green. One ball landed within three feet of the pin. According to Allan Brilz, it was effortless using the new XE1 wedge. As if this wasn’t good enough, they went ahead and claimed that fat chips and pitches would be a thing of the past with the new XE1. There were many other promises, but they all added up to one thing – the XE1 would revolutionize every golfer’s short game like never before. After over a year on the market, the dust has settled, and there’s never been a better time to review the XE1. So, is the XE1 Wedge a masterpiece or just another scam? Let’s decide on this comprehensive XE1 Wedge review. It's not a very versatile piece since the variety of shots you can make with the club are limited by its 65-degree loft angle and the giant sole. The XE1’s head is slightly bigger than that of an ordinary club. The club face and the front edge is generally round. It has a sleek and modern look that definitely gets a player’s attention. The high loft angle adds to the high-tech and unique feel of the wedge and the red/black color combo against the silver finish adds a sporty touch. The over-sized Autoglide sole looks solid and durable. 12-time PGA Tour winner Doug Tewell created the square to a square method used in designing the Xe1 Wedge. Tewell’s square to square method gives the XE1 a slightly heavier head as compared to most wedges. This design makes alignment easy and offers a great pitching wedge loft. Its design will make men’s golf tournaments more exciting. Golf Tailor, LLC designed the XE1 Wedge to be an outstanding performer. It’s high loft angle, auto glide sole, and extreme heel-to-toe weighting combine to give you the perfect shot. There’s no doubt that the XE1 Wedge is a unique golf club with leading-edge technology. There’s no doubt that the XE1 Wedge is a unique golf club. One of the key things that differentiate this club from other pieces on the market is its extraordinary design which comes with an extreme degree wedge loft angle. If Golf Tailor, LLC was to justify all the promises they made about the XE1, they would certainly cite its high loft angle as the reason they claimed to get golfers out of bunkers with a single shot. While the standard sand wedge comes with a 55-degree loft angle, the XE1 sports about 65 degrees. A difference of about 10 degrees may not seem much to an ordinary individual, but to a true golf enthusiast, it can make all the difference when it comes to getting your way out of bunkers in every golf game. The XE1 pitching wedge is also higher than the lob wedge's standard of up to 64-degrees. Thus chip shots with the XE1 Wedge are more comfortable compared to its competitors. With XE1’s Extreme loft angle, a player doesn’t need to be a professional golfer to hit a perfect flop shot. The problem with a loft angle of higher than 64 degrees is that it makes it harder to make chipped shots. It predisposes golfers to dig into the turf as they attempt to get under the ball for a perfect chip. So, did Golf Tailor LLC address this issue with the XE1? Turns out they did, and it’s quite impressive that they got it right. The XE1 is equipped with an impressive bounce, which is generated by the Autoglide sole. Thanks to this exceptional feature, it’s much easier to get the ball into the air. The Xe1 Wedge is designed with a larger/ broader sole to give maximum forgiveness as well as a high bounce feature. This technology works flawlessly in combination with the uniquely designed high loft angle and the square to square methodology. Golf Tailor LLC designed the XE1 with extra weight on the toe and heel of the golf club. They often term it as the “Extreme heel-to-toe weighting” in their ads. This unique addition makes the XE1 an appealing option for handicap golfers. The main advantage of the extra heel-to-toe weighting is that it widens the sweet spot by lowering the center of gravity and evenly distributing weight across the face. This gives users more forgiveness in putters, and significantly reduces mishits. Thanks to the extreme heel-to-toe weighting, the XE1 wedge is perfect for escaping traps, bunkers, and tough lies just like the manufacturers promised. As the face comes into contact with the ball during a full swing, you can’t help but feel the nice, laid-back sensation of the XE1’s impact. It’s not too loud or too quiet – it’s just perfect. Read: How to Grip a ​​Golf Club – Does Strength Really Matter? 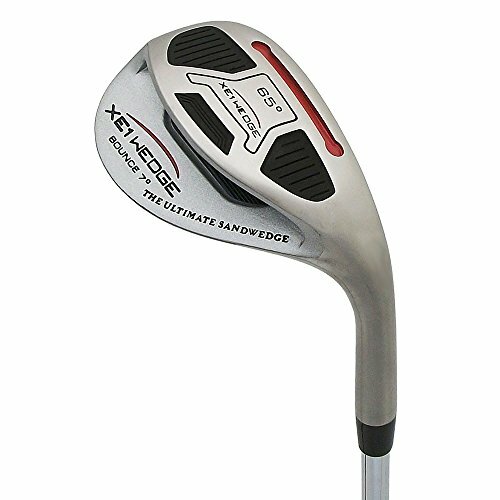 Although there were concerns that the advertisements were too good to be true, this XE1 Wedge Golf Club review proves they were actually right and can be considered one of the best golf wedges out in the market today. It is true that the XE1 eliminates fat pitches and chips from your gameplay, and helps you navigate your way out of bunkers by providing the sweet spot whenever you swing and get out of any golf channel. Since it comes with a 3-month money back guarantee, there’s no reason you shouldn’t give the XE1 Wedge a try. Additionally, your shot depends greatly on the club you’re using, thus, it’s important to know the difference between them.